In case you missed it (as did most of the national media), here’s a link to U.S. Sen. Charles Grassley’s letter taking the FBI to task for its troubling lack of transparency in the Boston Bombing investigation. 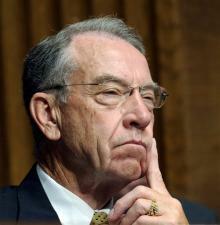 Grassley, a senior Republican from Iowa and a member of the Senate Judiciary Committee, is peeved because the Bureau and Director James Comey have stonewalled him on a series of questions he asked in June about the bombing. In his letter, Grassley hints that Cambridge, Mass., police believe the FBI had identified the Tsarnaev brothers as suspects and had a large team of agents on stakeout for them at Cambridge’s Central Square without sharing the information with local authorities. An FBI flack replied through the media that the agents were in Cambridge as part of an investigation unrelated to the bombing. So in other words, as thousands of federal, state and local law enforcers were frantically engaged in the country’s highest-priority terrorism investigation since 9/11, the FBI claims that it peeled off a squad of agents to chase another crime in the same locale. With the letter, Grassley—a persistent FBI gadfly—joins his congressional colleague U.S. Rep. William Keating, a Massachusetts Democrat sent his own scathing letter to Comey in July, as America’s leading political skeptics of the FBI’s opaque account of the bombing and its aftermath. There are 95 comments Our Comment Policy: Keep it civilized, keep it relevant, keep it clear, keep it short. Please do not post links or promotional material. We reserve the right to edit and to delete comments where necessary.